Hello, since several days I have noticed that my data transmission is regularly interrupted. I don't understand what's going on, everything seems ok for me... Is it a displaying problem or does my receiver have a problem? No problem 'down under' so its a limited regional or local issue. This problem is still present. When will it be solved? Add the following two parameters to /etc/fr24feed.ini, save and restart your Pis. This will fix it. FR24 should push this as an automatic update to their clients. I cant do this at my own. I have no any linux knowledge. Khan, tnx for the info.....worked perfectly. The most important thing is that you are able to access files on your RPi. To do this you have to install a software called "PuTTY" on your Windows Desktop/Laptop. If you use Mac, then its Terminal can be used to access the RPi and you dont need to install PuTTy. 1.2 - Doble click downloaded installer to install the PuTTY. 1.4 - Enter your Pi's Local IP you found from your router (it is same IP which you use for viewing dump1090 map or status/settings page). Make sure SSH is selected and port is 22. Click Open button. (The IP address 192.168.0.21 in screenshot below is given only as an example). 1.6 - A SSH Console window will open with one line Login as . Type pi and press enter. Then it will ask password . Type password raspberry (the typed password will not be visible to you). Press Enter key, and you are ready to start using commands. 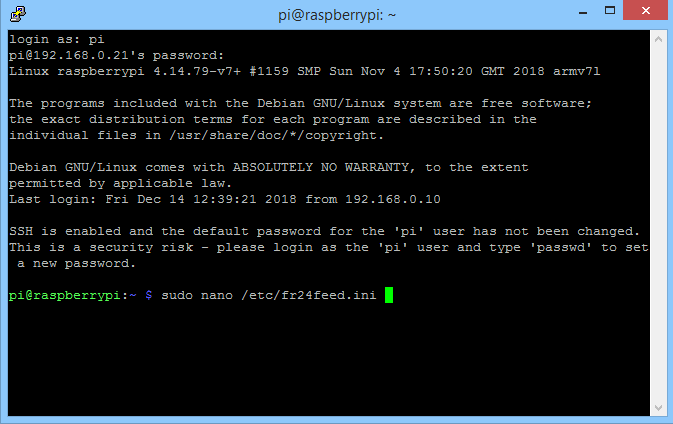 2.1 - Type sudo nano /etc/fr24feed.ini and press Enter key. 2.2 - Above command will open file fr24feed.ini for editing. After adding two red lines, Save file by simultaneously pressing Ctrl+o keys, then Close file by simultaneously pressing Ctrl+x buttons. Last edited by abcd567; 2018-12-14 at 23:32.